St. Agnes of Montepulciano may be best known for an incident that occurred many years after her death. About seventy years after Agnes died, St. Catherine of Siena made a pilgrimage to the shrine of this revered Dominican foundress. 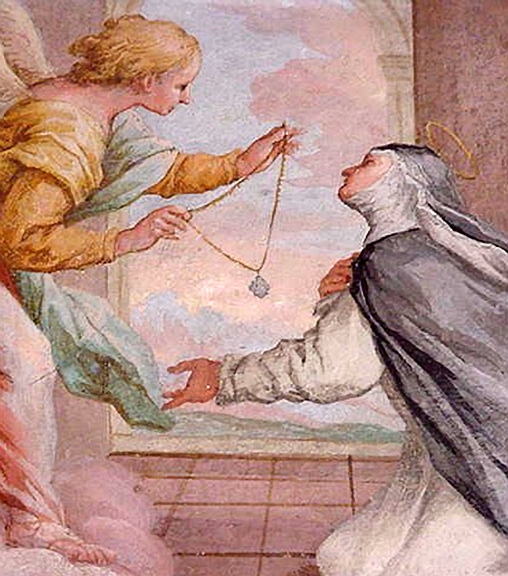 St. Catherine bowed to kiss Agnes’ foot, the saint raised it up toward her. Catherine may not have been totally surprised, as miraculous characteristics had surrounded Agnes’ life. This “little lamb” was born not far from Montepulciano in 1268. She expressed a desire to give her life to God and practiced pious exercises from an early age. Now and then, her parents gave in to her requests to visit the various convents in town. On one such occasion, Agnes and her mother were passing a house of ill repute, when a flock of crows suddenly descended upon her, pecking and scratching the little girl. Her mother remarked that the crows represented demonic forces threatened by her purity. Indeed, years later, Agnes would be asked to found a convent on that very spot. In her teens, Agnes joined the Franciscans in Montepulciano and rose to become its prioress. Small white flakes in the form of crosses fell gently from the heavens in celebration. It is said that the sisters have preserved some of these until today. In 1306, God inspired Agnes to found a Dominican convent with three stones given her by the Blessed Mother in honor of the Trinity. The Blessed Mother had visited Agnes many times. On one of these occasions she allowed Agnes to hold the Christ Child, but Agnes showed great reluctance in giving him back. Toward the end of her life, Agnes sought healing from some famous springs. Although she did not receive healing herself, her prayers effected the resurrection of a child who had drowned in the springs. In 1317, Agnes died in Montepulciano and received her long-awaited reward.